'Ugh!' said the Lory, with a shiver. 'I beg your pardon!' said the Mouse, frowning, but very politely: 'Did you speak?' 'Not I!' said the Lory hastily. 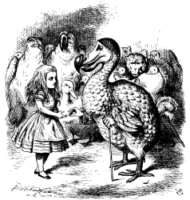 'Of course,' the Dodo replied very gravely. 'What else have you got in your pocket?' he went on, turning to Alice. 'Only a thimble,' said Alice sadly. 'Hand it over here,' said the Dodo. 'I beg your pardon,' said Alice very humbly: 'you had got to the fifth bend, I think?' 'I had NOT!' cried the Mouse, sharply and very angrily. 'I didn't mean it!' pleaded poor Alice. 'But you're so easily offended, you know!' The Mouse only growled in reply.